While U.S. drone strikes have faced new scrutiny in recent weeks, a majority of the public continues to support the program. Overall, 56% approve of the U.S. conducting missile strikes from pilotless aircraft to target extremists in countries such as Pakistan, Yemen and Somalia; just 26% say they disapprove. Opinion is largely unchanged from last July, when 55% approved of the program. 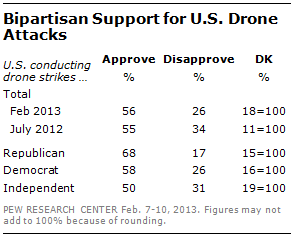 Support for drone attacks crosses party lines: 68% of Republicans and 58% of Democrats say they approve of U.S. drone strikes. There also are stark gender differences in opinions about the use of drones: Men approve of drone strikes by more than three-to-one (68% to 21%). Among women, 44% approve, while 31% disapprove. The latest national survey by the Pew Research Center, conducted Feb. 7-10 among 1,004 adults, finds that while drone strikes draw continued support, there is widespread concern that the attacks endanger innocent civilians. 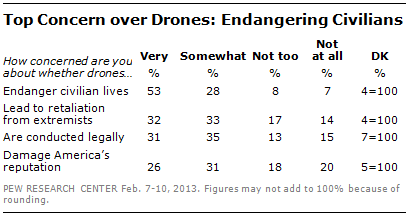 Overall, 53% say they are very concerned about whether drone strikes put the lives of civilians in danger. Even among those who approve of the program, 42% say they are very concerned the attacks risk lives of innocent civilians. Other possible consequences from drone attacks spur less public concern: 32% are very concerned they could lead to retaliation from extremist groups, 31% are very concerned the attacks are being conducted legally and 26% worry they could damage America’s reputation around the world. 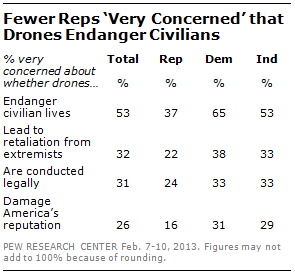 Democrats are much more likely than Republicans to express concern over whether drone attacks endanger civilian lives. Nearly two-thirds (65%) of Democrats and 53% of independents say they are very concerned about whether U.S. drone strikes endanger the lives of innocent civilians, compared with just 37% of Republicans. 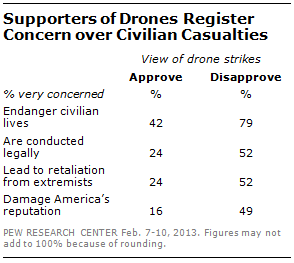 The partisan gaps are smaller in concerns over other possible consequences from drone attacks. For each, fewer than half of Democrats – and even smaller percentages of Republicans –express a great deal of concern. Among those who approve of U.S. drone strikes, 42% say they are very concerned about whether the attacks endanger the lives of innocent civilians. No more than a quarter of drone supporters say they are very concerned about the three other possible consequences tested. Among those who disapprove of U.S. drone attacks, nearly eight-in-ten (79%) are very concerned about possible civilians casualties; About half say they are very concerned over whether the attacks are being conducted legally (52%), whether they could lead to retaliation from extremist groups (52%), and whether they could damage America’s reputation around the world (49%). Women are much less supportive of U.S. drone strikes than are men and they express far greater concern over the possibility of civilian casualties. Overall, 44% of women approve of the U.S. conducting missile strikes from pilotless aircraft, 31% disapprove while 25% offer no opinion. 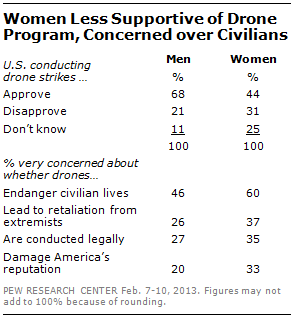 By contrast, men support drone strikes by more than three-to-one (68%-21%). Six-in-ten women (60%) say they are very concerned about whether drone strikes endanger the lives of innocent civilians compared with 46% of men. Less than half of women say they are very concerned about other possible consequences, though they offer somewhat more concern on these issues than do men.